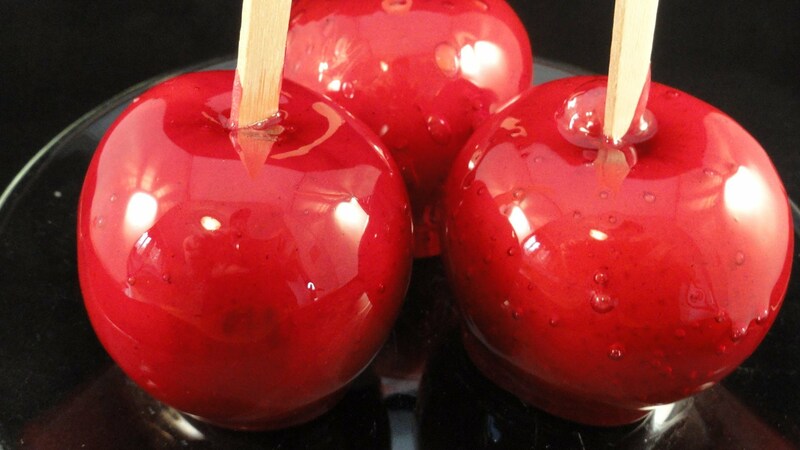 Home » DESSERT » WHERE DO CANDY APPLES COME FROM? WHERE DO CANDY APPLES COME FROM? Exacty what is a candy apple and where did it come from you ask? Well, surprisingly, Newark, New Jersey is the birth place and the year was 1908. William Kolk, a confectioner was experimenting with red cinnamon candy for Christmas and he dipped some apples into the leftover mixture. He put the brightly colored apples in the windows for display and they sold like hot cakes (or candy apples if you prefer that analogy). Soon candied apples were being sold not just in Jersey but up and down the East Coast (think Coney Island, circuses and carnivals) and in candy shops across the country. While the original coatings were sugar/candy based, caramel and chocolate topping soon became popular. The stick that’s almost always in the middle was there from the beginning and it obviously just makes them easier to eat. The best apples are available right NOW as in go get them NOW. The recipes can swing from the ultra easy unwrap pre made caramels, melt them in the microwave and dip your apples to the use a candy thermometer and make your own caramel or candy coating. You can, of course, make really elaborate apples by covering the coating with chocolate (white or dark), nuts, candy and anything else you can think of. Time and willingness to get up close and personal with a candy thermometer will determine what type of covered apple you make. Some might say, hey, why go to the bother of making caramel apples when you can just buy them in just about any grocery store or gourmet candy store. My answer is: why pay a bazillion dollars for a mega apple or one that was made weeks ago when you can make your own ultimate apple for a fraction of the cost and ten times the taste? Place a large cooling rack on a baking sheet lined with parchment or wax paper. Insert a fork into the top of each apple. Combine the sugar, grenadine, and light corn syrup in a saucepan and bring to a simmer. Stir until the sugar is dissolved, brushing down any crystals on the sides of the pan with a pastry brush dipped in warm water. When the sugar is dissolved, bring to a boil until the syrup reaches 285° on a candy thermometer, the soft-crack stage. Set the pan over-not in-boiling water. Working quickly, uses the forks to dip the apples, one at a time, coating them evenly with the glaze. Remove from glaze and twirl each apple so the extra syrup drips off. Set the apple on the cooling rack. When you have dipped all the apples once, repeat the process. Remove the forks. Serve at room temperature. Best eaten within 24 hours. Makes 6. BEWARE the cooked syrup is very sticky can burn. Parental supervision suggested! Place wax paper on a cookie sheet and set it aside. Combine all ingredients except the into a small, deep saucepan. Mix to combine with a wooden spoon and cook, over medium heat, stirring until sugar is dissolved. Be sure that all the ingredients come to a boil and reach about 290° to 300° on your candy thermometer. Once the syrup has reached this temperature remove the mixture from the heat. Begin dipping the apples and place the dipped apples on the prepared pan. Makes 6 to 8.